Excluded from the debate?! Travis will tweet! Travis Irvine will not be silenced. Despite being excluded from the Governor’s Debate tonight, and no invites yet for the two coming next month, Travis Irvine will make his answers available for everyone. Let’s make a noise that can’t be ignored! 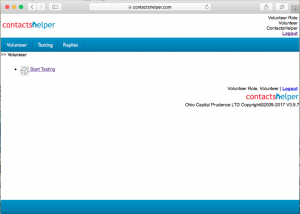 Working as a volunteer is easy with Contactshelper! 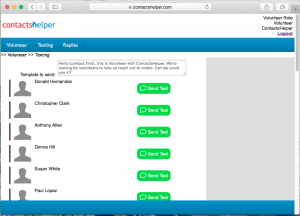 Sign into your Contactshelper account with the Login Name and Password you were assigned. 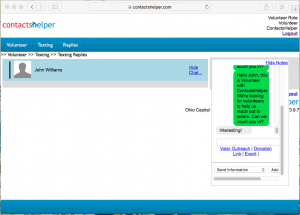 Your Volunteer Coordinator will have added contacts for outreach to text. When you sign in, click “Start Texting” to be assigned contacts. As a volunteer you don’t need to worry about who you’re texting or even what to write to get started. Click on the “Send Text” button to the right of the contact name and the template shown at top will be sent to the contact. That is the Contactshelper system connecting you to the voter or donor. 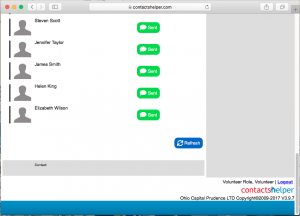 Work through the list of contacts on the page, when all have switched to “Sent” click on Refresh to load more. When you run out of contacts or need to be done, you can check on the Replies page to see who has answered your texts. As people respond to your texts a number next to the Replies link will increase. While you are chatting with voters or donors new replies will appear at the top of the page and show with a green chat bubble that they have a message you have not seen. Clicking on Show Chat will reveal the chat sidebar and mark that message as seen. Use the chat sidebar to answer questions, share links and inform the voter or donor about our campaign. When the contact sees your text on their phone they will see the main campaign number, not your number. If they text back later, the text will be added to the chat and the volunteer coordinator will follow up. When texting with Contactshelper you don’t see their phone number and they do not see yours. When chatting with a contact you may also use “quick chat” templates provided by your volunteer coordinator for this campaign. These appear below the chat box and button. These links place text into the chat box, often with the contact’s name merged, sharing links or event information. In addition to chatting with the contact you can leave notes. Please take the time to note the response you received for your outreach, even marking “No Answer” is helpful for the campaign coordinator to keep track of your effort and success. Thank you for volunteering! Your help is appreciated! Travis Irvine recently sat down with NBC4i to discuss pressing matters for the state of Ohio and its citizens. When asked about voters that supported Dennis Kucinich in the Democratic primary and Mary Taylor in the Republican primary was candid about understanding their issues. Donate today to support Irvine for Ohio and our Libertarian candidates across the state! The Libertarian Party has always supported the legalization of marijuana for all uses and many people believe that marijuana could be a way to wean those struggling with addiction off opioids. Regarding supporters of Mary Taylor, Travis says it comes down to what people think of Mike DeWine. 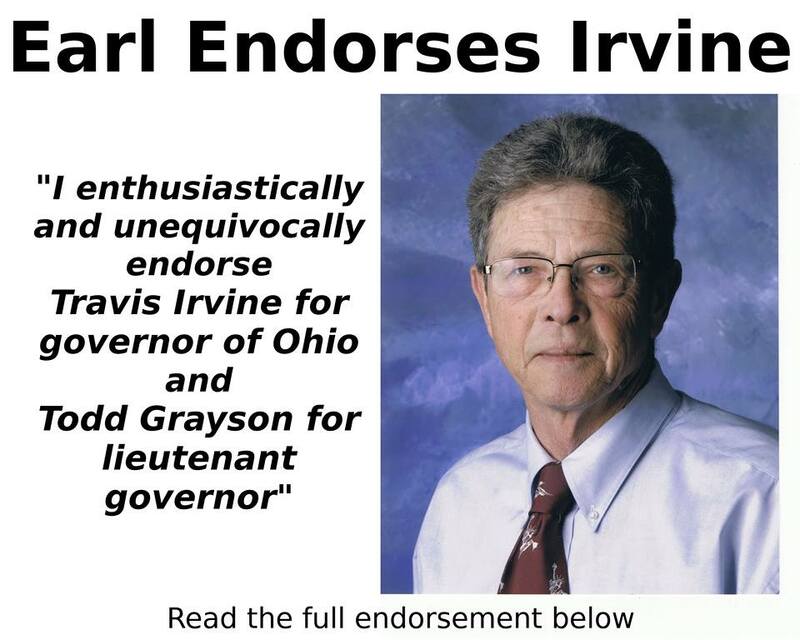 Irvine for Ohio Endorsed By Charlie Earl! 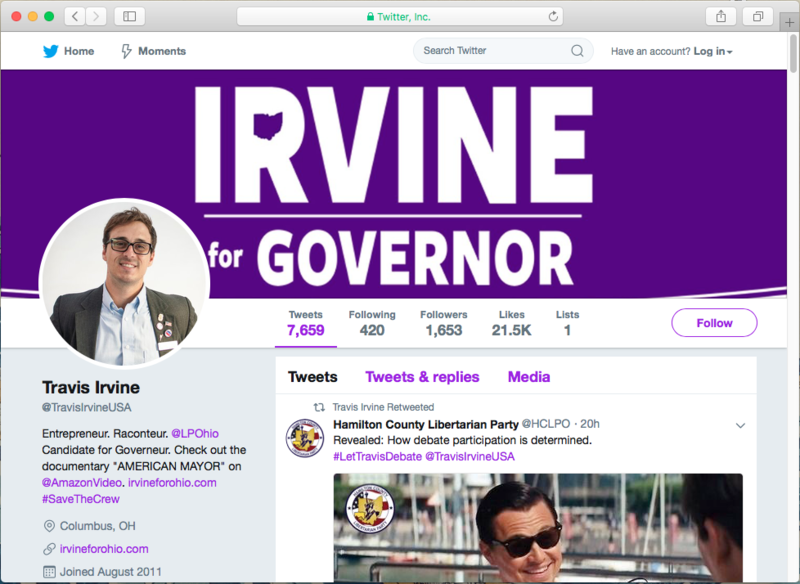 COLUMBUS—Libertarian Travis Irvine received the first major endorsement of his campaign for Ohio governor Tuesday from Charlie Earl, the party’s 2014 candidate for the same office. Support Libertarian Candidates across Franklin County and Ohio! “With the ever-increasing growth and interference of the federal government affecting our daily lives, it is vital that the citizens of Ohio elect a governor and lieutenant governor who are dedicated to individual liberty. Gubernatorial candidate Travis Irvine and Todd Grayson, his running mate, are prime examples of the type of public servants Ohioans require. Our historic reliance on the two-party system has led to the betrayal of our people and the undermining of our democratic republic. Travis and Todd represent a new beginning for Ohio. Fresh ideas and liberty-driven energy are the cornerstones of their efforts to return our state government to its rightful place as a responsive servant of the people rather than a master of our fates. “I’m extremely grateful to receive the support of a great man and great candidate like Charlie Earl, and I plan to pick up where he was forced to leave off in standing up for Ohio against the two corrupt parties that control Columbus,” said Irvine in response to Earl’s endorsement. Earl’s 2014 run for governor, which would have easily won enough votes to retain ballot access for the Libertarian Party, was derailed when Secretary of State John Husted first certified Earl’s candidacy, then removed Earl’s name from the ballot after Republican party officials orchestrated a technical challenge to Earl’s petition. Though the rule in question was ambiguous had never been enforced for Republican or Democrat petitions, Husted’s ruling was upheld, forcing the Libertarian Party of Ohio to regain ballot access by spending more than $250,000 on getting more 100,00 signatures from Ohio voters. Learn more about Irvine for Ohio. Show your support for Libertarian Candidates across Franklin County and Ohio, Donate, Volunteerand Get Involved! 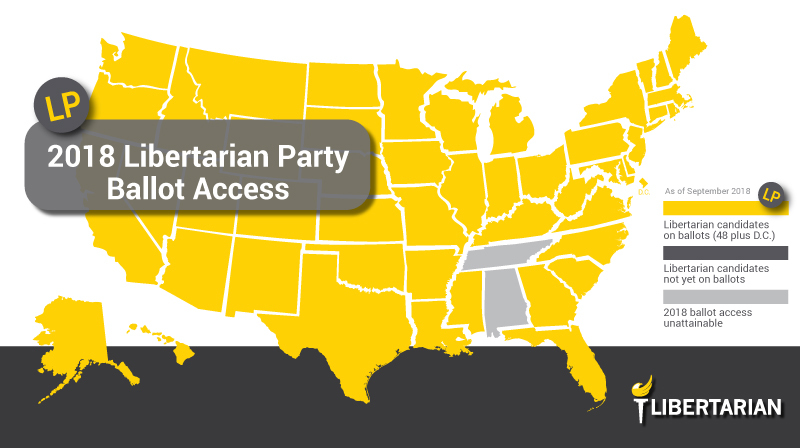 Libertarian Party has Ballot Access in 48 states! Months and months of hard work have been paying off as we cross the ballot-access finish line in more states. This week, we add Connecticut, New York, and Pennsylvania to the tally. That puts us at ballot access in 48 states (plus DC) for 2018! Months and months of hard work have been paying off as we cross the ballot-access finish line in more states. This week, we add Connecticut, New York, and Pennsylvania to the tally. That puts us at ballot access in 48 states (plus DC) for 2018! 20 years that voters in Connecticut will be able to vote for a Libertarian candidate for Governor! Plus, the two states without ballot access, Tennessee and Alabama, aren’t completely without ballot access. In fact, Alabama has four candidates on the ballot as Libertarians for local or state house offices. However, we don’t categorize Alabama as fully on the ballot because Alabama Libertarians didn’t qualify for a statewide office. Tennessee has five candidates on the ballot as independents because they didn’t qualify to get on the ballot as Libertarians. The states of Alabama and Tennessee both make it especially hard for Libertarians to qualify for the ballot – something we’ll continue fighting to improve. Please join me in congratulating and thanking all those who have pitched in to achieve ballot access for 2018. This includes thousands of activists, volunteers, donors, and staff and the Johnson/Weld campaign which achieved ballot access for us in 37 of these states.